Today we are interviewing Lory La Selva Padauno, author of the historical fiction novel "The High Priestess." What can you tell us about your new Historical - Fiction novel, "The High Priestess"? I'd like to begin by saying , it's quite an exceptional journey. From the present to the future and back, the book involves many elements of surprise and intrigue. Our main character ''Khafa'' is very strong willed and ambitious, while our second in command, is quite focused but somewhat lost at times, a great example of what we sometimes seek in our very souls, or are too afraid of becoming. Naturally I'd like to say that the right audience would be those who like to indulge in Historical - Fiction, the very readers that ''want the truth, inside the lie'', but I feel that we sometimes label and categorize our genre's all too well, and with good reason of course, however, I do believe that the avid reader would enjoy this book immensely for the simple fact that it has much more than History or Fiction in its contents. What drew you to the Historical - Fiction genre? As a long time lover of History and mysticism of the ancient world, it was easy to determine where I was headed. I'm an avid reader and I enjoy many books, but there has always been a dormant ''calling'' until the last two years of course, to pursue my writing in this fashion. It tickles my fancy, and it awakens me, in a manner that cannot be described, but only felt. 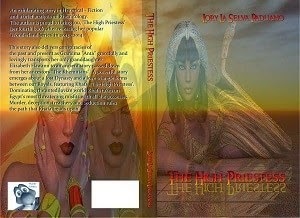 ''The High Priestess'' features the Khemitians. When did you first become interested in the Khemitians? What we've been taught in History classes for the last 4, 500 years by Historians, is very bare boned and basic. There's always another way, always another story, and for the Khemitians, there's always the truth. I became excessively involved in their teachings and it peaked my interest because I'm skeptical by nature, investigative by character, and this was something that needed to be exposed. Even though books have already been written about Khemit by many authors, for me it was about incorporating another view, with facts and fiction, whereas most of these authors only introduced Khemit and History. One would do well to explore the Khemitians and their teachings and expand their horizons and read ''The High Priestess." Tell us a bit about protagonist Khafa. Oh where do I begin! When we look at her character closely, we can see the ''Alpha & Omega" all bundled up in a sweet package. She is beyond beautiful and she uses this to further herself and her plans in this story. Khafa is someone we would all love to be, well, the better side of her of course, she's versatile and ever so clever, she can bring courage and hope in our weakest moments, and she's someone that many might cheer on, or love to hate, either way, she's perfect and undeniably the star of the show! *No spoilers here*. I want to say what others have said and that's easy. Many have said I'm very descriptive, all have said I'm definitely not lacking any imagination but the best description by far, is that they've dubbed me the ''Queen'' of great plots and too many twists to count. I thank them for the feedback, it's nice to hear, when someone like myself is very critical of their writing style, or at times insecure. It's an escape form reality. I'm someone who feels deeply, loves deeply, and writing just brings me to the next level of freedom, where I can write my thoughts and never be punished for it. It's therapeutic to a sensitive soul like myself, who's been injured and plagued with physical illnesses in the past two years all due to the fact that I invested many hours in my trade. I found something many years ago in writing and have recently brought all my stories to life, injuring myself in the process, but I wouldn't want to have it any other way, this is the best part of it for me because it's real. Is there anything else you'd like potential readers to know? There's so much to say, and I would like to mention that Indie writers are some of the worlds most dedicated writers to their fans. It's all for them, whatever we put down on paper, its due to the fact that people request it, they have a thirst for it, they want relatable, innovative, imaginative, grippingly told stories that touch their hearts, play with their minds, and open up portals to other dimensions that have yet to be discovered. We're the little people, but our stories are big, and they are deep like the crevasses on Mars. Investing in an Indie authors works, not only helps the author grow, but there is one motto I live by, ''PAY IT FOWARD'' with me, it's all about giving back to my readers.